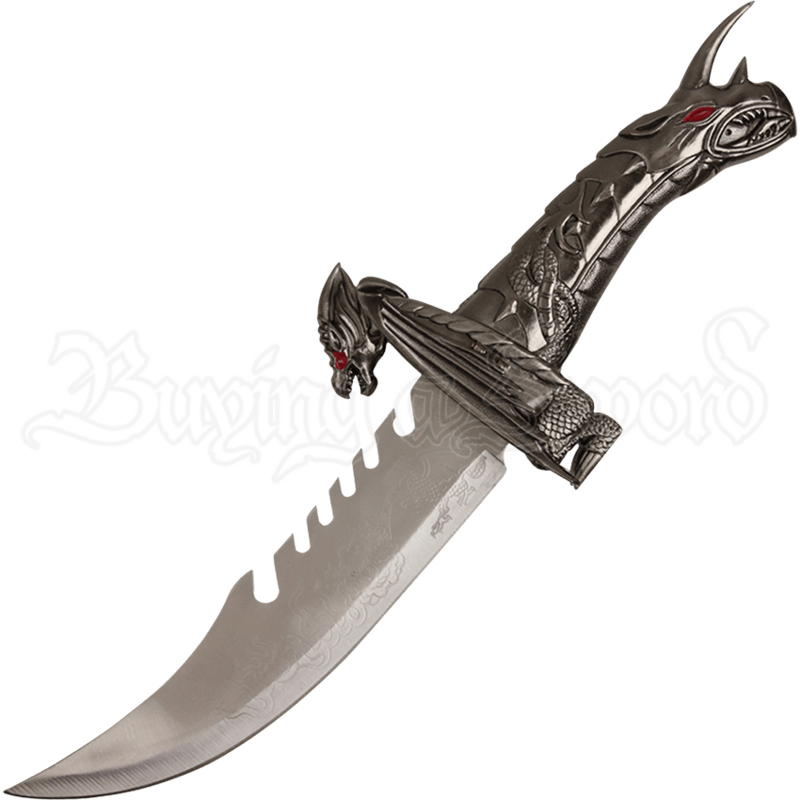 The evil, demonic forces of the dragon scourge can be seen on the wicked looking blade known as the Demonic Dragon Dagger. Every one of the red-eyed, winged lizards on this knife are creatures from the deadliest parts of the abyss. The handle of this evil looking dragon dagger takes the shape of the head and neck of a dragon. The head of the dragon makes up the pommel, its red eyes squinting and its mouth in an eternal snarl. A large horn juts from its forehead. The hand guard of the dagger is shaped like a dragon with wings for front arms. Its wings are held off to the side and its mouth is open as if it were shrieking. The scabbard of this blade depicts a traditional European style dragon and a demonic looking creature. The blade of this dagger curves slightly upward and bears a serrated edge on its spine. The image of a dragon breathing fire has been etched into the face of the blade. This demonic looking weapon is perfect for everyday light use and makes a great decoration. Give it as a wicked looking gift to a friend or loved one, or add a draconic flair to your home!